In my previously written review on SniperSpy Keylogger which is supported only for windows OS,In that review I concluded that Sniperspy is the best keylogger to hack Facebook Account,Gmail Account or any other Email Account Password. Now I am writting review on Sniperspy keylogger for Mac Users because many peoples are using Mac Operating System. SniperSpy Mac Review: What Is It & What Does It Do? SniperSpy Mac is the only software that enables you to secretly watch your Macintosh like a TV! 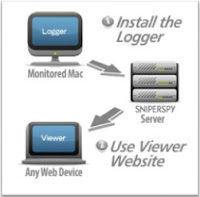 SniperSpy Mac offers you the ability to monitor activities online in real time. Your logs are safely stored in your secure Internet account which is accessible only by you. You can check logs using any web browser. You can login anytime from any location to view results without needing access to the Mac. The activities recorded are each described below. All logs can be printed for actual physical evidence! How Does SniperSpy Mac Work? Once you install to your Mac, SniperSpy will begin recording a wide range of Internet and Mac activities. These activities are uploaded to your private control panel. The activities recorded are each described below. All activities include a date/time stamp. Unlike some other remote monitoring software, SniperSpy’s control panel uses a https connection for secure viewing. It also offers you the power to view graphical representations of data captured and a jpg picture of the screen however often you’d like. The screenshot is shrunk to fit your screen, or you can zoom in at full size to read the text. Store up to 100 of these screenshots inside your account. Actual Screenshots – Like a surveillance camera pointed at the screen, the entire screen on the remote Mac is captured, showing all active programs, folders, or web pages. Screenshots of the actual desktop are captured, displaying whatever the user is doing on your remote Mac. There will be no hiding their activities from your eyes. Everything they saw you will see. Keystrokes Typed – Every keystroke that they type while using your Mac will be recorded. Each record will show what was typed and which program or window it was typed. Concerned about what your child posts online? Recording all keystrokes will show you what they are typing while online, from online posts to passwords to website searches and instant messages. Full Chat Conversations – Every IM chat conversation that occurs on your Mac will be recorded, showing both sides of the conversation and the usernames of those chatting. Concerned who your child or employee may be communicating with? You will now see any and all chat conversations that take place on your Mac, including the usernames of both parties. Live Time Screen Viewer – Watch all the activity that occurs on your Mac live as it happens. Everything they do you will be able to watch them do live. Wondering what your child or employee is doing on your Mac? Watch what they do live as it happens. Every open window, website, or program will be displayed running in real-time. Browse File System – Navigate through your remote Mac’s file system at any time to see what they might have saved or hidden on your Mac. Curious as to what might have been saved on your Mac? You can navigate through your Mac’s file system just as if you were in front of it. The user will never see anything. So what are you waiting for, Get your hands on the best Keylogger for Mac OS and Start Monitoring Victim Computer.